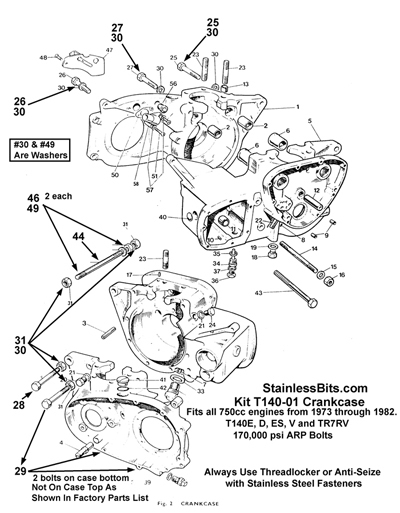 StainlessBits.com offers pre-sorted stainless steel fastener kits for British motorcycles. These kits take the agony out of measuring, counting and sorting hardware as you put whatever it is you took apart back together. They are especially helpful if you have a pile of "stuff" with no idea about what goes where. 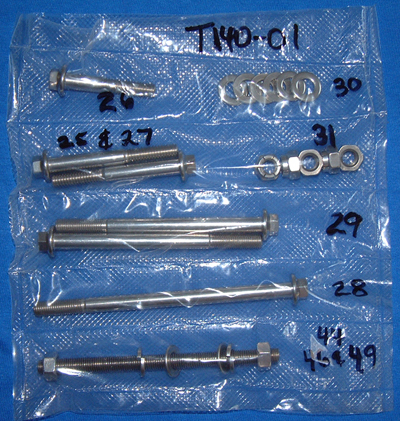 You will find a growing list of bolt kits in the shopping cart. Kits are researched and assembled here. We go the extra mile, including high strength bolts, custom fasteners, fiber and nylon washers, and British thread screws, where required. You won't get stuck with a baggy full of mixed nuts and bolts. Parts bags are compartmented and marked, and a detailed illustration is included. There are others out there selling kits, but none can equal a Bits Kit. StainlessBits Kits are usually offered plain, buffed or polished. You will notice a number of StainlessBits Kits are listed as "Coming Soon". In most cases, this means that I am waiting for a custom fastener before I release that kit. Some are made here, but some must be farmed out. Please check back often for updates. At the moment, I am in the process of loading the literally thousands of available kits into the shopping cart. If you don't see your kit, ask for it. I probably have it available. Visit the site often to watch it grow.